Discussion in 'V.C. 's Parlor' started by surfrodguitar, Feb 14, 2019. 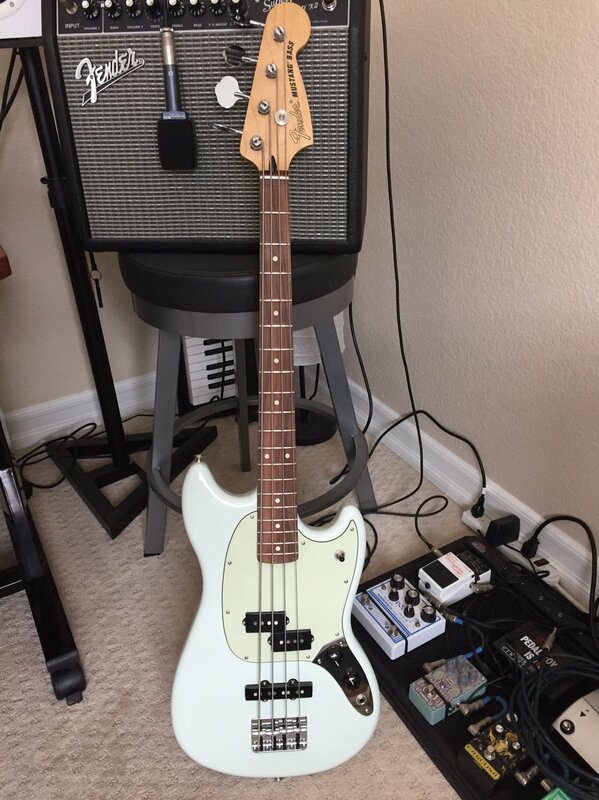 Since I traded my PBass away, I needed one so I picked up the Mustang PJ bass in Sonic Blue! Wish it was a bit more blue but man it’s so much easier to play than the full size. Even got to lay down a bass track with it so I’m stoked on it. otisblove, Bluzy, fadetoz and 15 others like this. Conghaille, Kenneth Mountain and surfrodguitar like this. 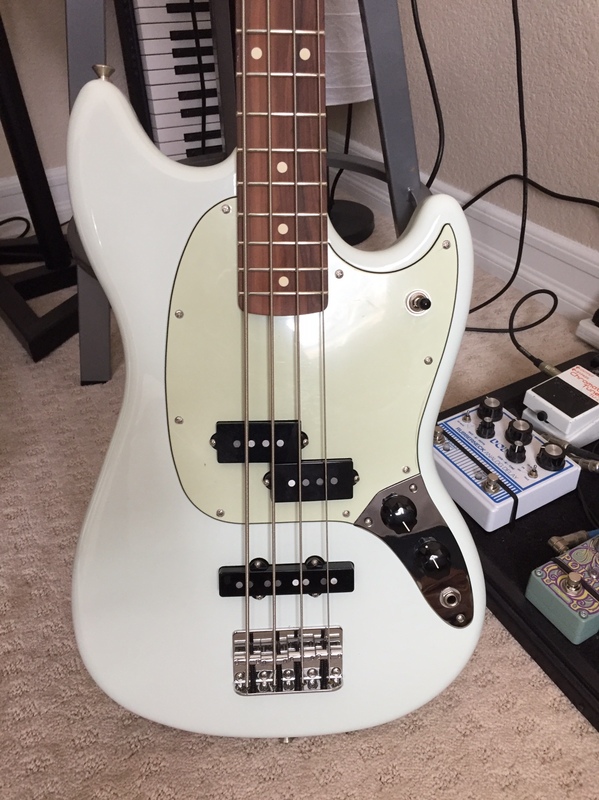 I like the bass but was not a fan with the switching and tone. They updated it to have no switch and vol, vol, tone. Sounds good in singular tones, but would not work for me personally. is that a short-scale bass? Kenneth Mountain, Taurus and surfrodguitar like this. Yes short scale, 30 inch. So fun to play. Kenneth Mountain, Taurus and so1om like this. Congrats. That's a beauty !!! I love being able to get around on it easy and the small body. Interesting so far the P Pu are more mellow than my P bass and the J Pu are more bitey. But I haven’t played it through an amp yet so lots of discovery to go. DI into my Mac sounds great so far. Kenneth Mountain and Taurus like this. It sounds great with the individual pickups. It sounds great combined. But in what I try and hear, when I have a great neck pickup tone, switch to another position, then I also have to dial around. Same with bridge going to other positions and likewise, the middle to either side. It's too much of a course jump and it would make the gymnastics in the middle of a song too much. Maybe even between a song as well while maintaining a professional show. 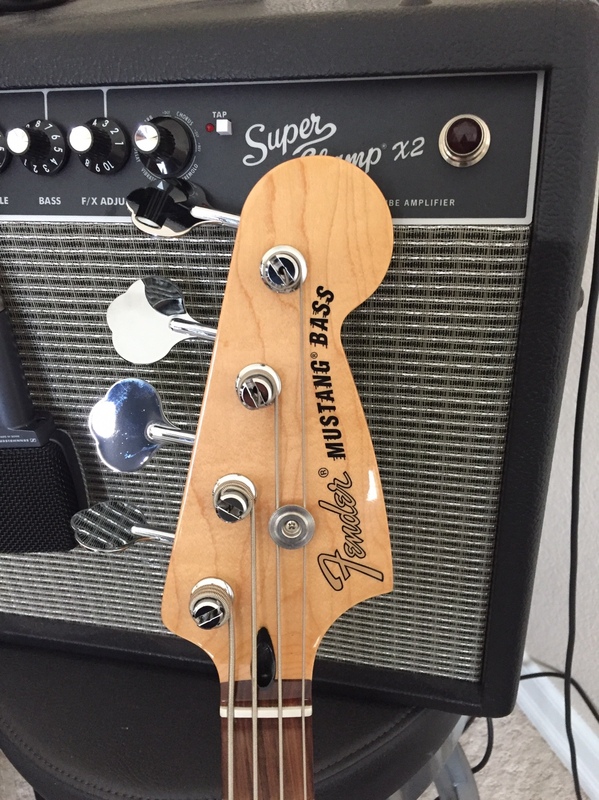 Whereas a Jazz bass, just dial one or the other up or down. But you know.. maybe i'm just old and slow. For recording, at practice, etc where there's no urgency and a moment to dial in, well there you go. radiotech and surfrodguitar like this. I’m far from Pro so no worries there! I love these short scale bass guitars. Enjoy! snivlem and surfrodguitar like this. Yeah me too! Reg scale, I feel like I’m wrestling with it, small scale feels correct for me. What can I say, I’m Filipino so I’m not a big dude. Big tuna and so1om like this. HNBD! I’ve come to feel the opposite on size, a few months ago I was on a short scale kick but when I played a few I thought it all just felt cramped. You’ll have to link the song you’re laying it down on so we can get a sound sample. I was looking at a Mustang 6-string in that color. It’s in the works, need to finish one by the end of the month for a recording forum monthly submittal that I have been cheesing on the last few months. Gotta commit! Blue or not, that's a nice looking bass! I wanted to try out a bass and decided that with my short arms and small hands a SS would be best for me. I ended up getting a Squier VM Jaguar SS. Very comfy to play sitting down. I don't think I'd do well with a full scale. @JohnnyMac I was going to do the Jag one but I read the fretboard is wide so I was hyped on the mustang so I just went for it. I like those new Rumble amps, if I ever get to play bass in a band, I would look for a rumble. That is sweet. I'd love to have one like it. I currently use a short scale bass. I got new strings and put a veritone in it and it works ok. Mine say Saturday Night Special on the head stock.. Can't find much info. I prefer the short scale. A full size bass is difficult to play for me. Feels like I can barely reach the first fret.